Because of its diverse properties, both chemical and physical, Zinc Oxide (ZnO) is widely used in many areas. ZnO technology is evolving continuously to meet new end-uses. Zinc Oxide powder has conventionally been used as a white pigment and as an additive to rubber. While it is largely used in other fields but its usage in rubber remains very important. There have been significant changes recently in the ZnO industry and owing to its multipurpose industrial use it also plays an important role in a very wide range of applications, ranging from tires to ceramics, from pharmaceuticals to agriculture, and from paints to chemicals. Therefore, it is clear that there are myriad of practical uses of ZnO. Here we provide a review of various Zinc oxide applications leading to its use in many industries. 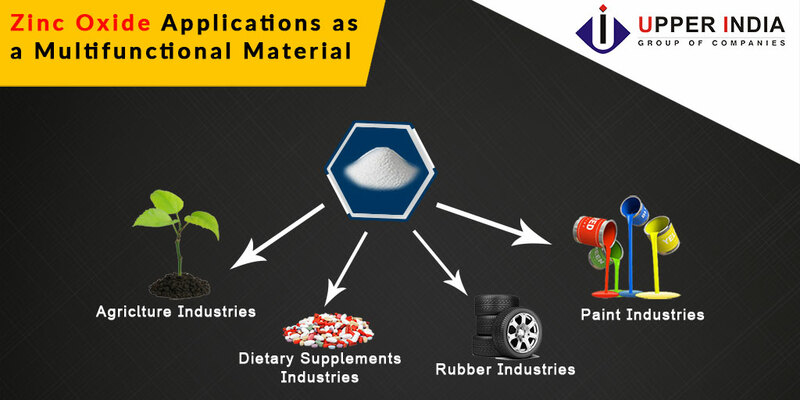 Apart from the applications mentioned above, Zinc Oxide can also be used in other industries as mentioned below-:Rubber IndustryZnO is the most effective activator to speed up the rate of rubber vulcanization. It is specifically effective in gelation of foam when latex foam rubber product is manufactured. Due to its high stability (resistance) in heat, it is largely used for tire manufacturing.Inks and PigmentsZnO is also used for the production of offset inks. It imparts good printing properties. Zinc Oxide is also used in pigments to produce shine.Food IndustryAdded to many food products, including breakfast cereals. ZnO is used as a source of Zinc, which is an essential nutrient. Also used in the process of producing and packing meat products and vegetable products. It suppresses the development and growth of fungi and moulds on the food materials.Animal FeedZinc oxide is widely used to supply zinc for animal nutrition in prepared feeds. It exerts a positive action on the animal’s health as it supports the correct growth of animals. As cattle feed, it is mixed in the diet or the drinking water for the animals.LubricatorZinc Oxide is used for the production of certain specialized lubricants and grease formulations. ZnO and its derivatives are also used as an additive to car lubricating oils. As is clear that ZnO is a multifunctional material. It has many interesting properties like high photo stability, biocompatibility and biodegradability that make it a very useful component in many core industries as explained above. Upper India is a proud Manufacturer of ZnO Powder and we are running two manufacturing units in India successfully. If you have any queries, please don’t hesitate to contact us.